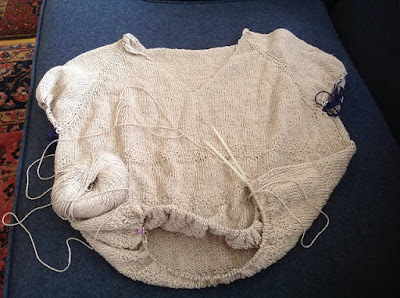 The Ewes have been busy as bees outside of knitting, but still there's a finished top, one almost finished, and a couple things on the needles. A bee shawl is on the maybe list, and Kelly is headed to pick up some real bees. Join us for our adventures. Marsha has finished her Edie tee! The Edie pattern is by Isabel Kramer and the yarn she used is Hempathy. This is her second Edie in Hempathy so no swatching needed. Now that's incentive to repeat a project! She doesn't yet have a finished project photo and that leads to a discussion of project pages and the Finished Object Radar feature of Ravelry. While talking about the Finished Object Radar on Ravelry, Marsha saw the Hollywood Flare Tunic by Vera Sanen and was intrigued. Kelly is almost finished with her Edie. This is also her second time with the project, but with a different yarn. The yarn is Linen Concerto, a variegated linen, rayon, cotton blend. Kelly's other project, Havannah by Heidimarie Kaiser, is making slow progress, but progress nonetheless. Marsha has been making progress on the Easy Folded Poncho and swatching for some sweaters. Meanwhile, Kelly is intrigued by two crochet shawls. Archangel by Katya Novikova is a pretty lace shawl with a Victorian feel. Hotel of Bees by Christina Hadderingh is a striped shawl with color and texture changes related to bees. The pattern was inspired by the book All the Light We Cannot See. This weekend Kelly is headed to pick up two packages of bees at BeeKind in Sebastopol, California. Each package holds about 10,000 bees who will be installed into two empty hives. During the discussion she mentions Les Crowder, an interesting and informative beekeeper who is a proponent of treatment free beekeeping. Here is what a package of bees looks like.